Will and 13-year-old Tom, a father and daughter camping out in the wilderness, are what most of us consider to be homeless. The self-sufficient duo, played by Ben Foster and Thomasin McKenzie in Debra Granik’s poignant, socially conscious drama Leave No Trace, live off the grid in a park in Portland, Oregon. They forage for food, squeeze drinking water from moss, and sleep in a tent surrounded by howling wolves. When Will isn’t “home”-schooling Tom, they’re playing chess or practising drills to avoid detection. No phones, no address. To the outside world, they’re practically invisible. The title Leave No Trace refers to a few things. It’s the ethical lifestyle of preserving one’s natural environment; it’s the altering of paths in the woods to minimise suspicion; it’s a reminder that vast swaths of America often go unnoticed in news coverage and narrative storytelling. Will, a former military man, suffers from PTSD – he left conventional society a while ago, and hasn’t looked back since. But when Will and Tom are caught by authorities, the phrase “leave no trace” takes on a new meaning. No serious crime has been committed, per se, so the pair are rehoused on a farm. Will’s trauma is triggered by a new job harvesting Christmas trees, and Tom initially struggles to fit in with her tech-savvy classmates. So once again, they run off – only this time, there’s some unspoken tension. Tom has tasted a humble world of plug sockets, minimised risk of hypothermia, and having friends her own age, and hence realised that maybe living permanently outdoors isn’t for her after all. How long can their perilous, permanently outdoors routine last? When we meet in London, Granik informs me that there are increasing numbers living in the Pacific Northwest’s national parks. “A lot of people have become unhoused,” she explains. “They’ve been priced out of housing markets. 2008 was, among many things, a war against poor people. It destroyed the infrastructure that allowed normal people to live. But whereas Lawrence went on to do X-Men, The Hunger Games and three terrible David O. Russell movies, Granik persisted with the indie world. Moreover, like the characters of Leave No Trace, Granik forged a path on her own terms: she followed up her awards success with Stray Dog, a 2014 documentary examining PTSD and poverty. The understated drama of Leave No Trace, though, is what makes the pay-offs so poignant. The film avoids heavy-handed exposition; the details of Will and Tom’s backstory are close to non-existent, and the few major storytelling moments are executed with minimal dialogue. The pure familial bond between father and daughter is able to speak for itself through tiny gestures – whether it’s resting a head on the other’s shoulder, the mutual trust in the face of danger, or a shared understanding that Tom will need to live a life of her own, too. What’s more, Granik has discovered another child star in McKenzie. Like J-Law in Winter’s Bone, McKenzie was a relative newcomer to the industry when she was cast. Yet in the past few weeks, the 17-year-old New Zealander has signed up for Taika Waititi’s new film, JoJo Rabbit, and is co-starring in The King with Robert Pattinson and Timothée Chalamet. Expect an internet nickname (T-Zie?) and red carpet pratfalls soon. 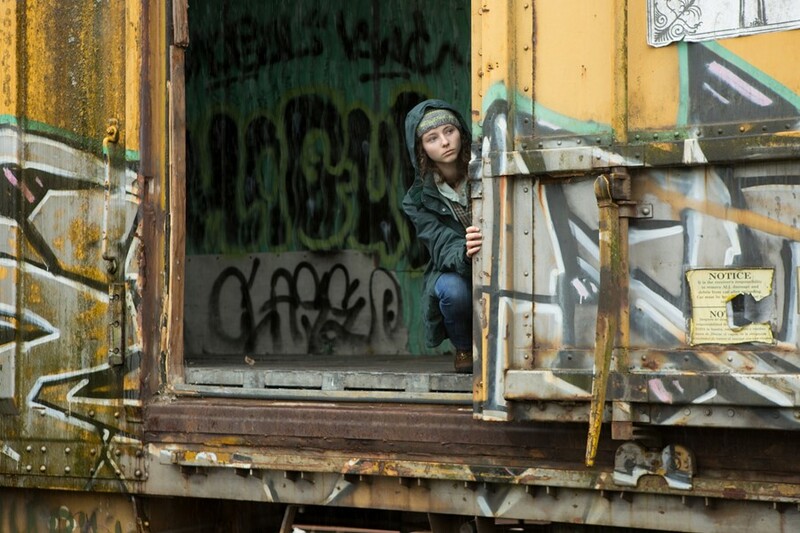 Moreover, it’s McKenzie’s emotional arc which drives Leave No Trace. She plays Tom as a wide-eyed, curious kid, an introvert who has conceivably never lived in a house or watched an episode of The Simpsons. As the film evolves, so too does her performance – in her body language we detect someone reconsidering her immediate future. Any doubts regarding the validity of Will and Tom’s lifestyle – it’s revealed that Tom, on an educational level, is years ahead of her age group – can be assuaged by the film’s source material. Granik and her screenwriting partner, Anne Rosellini, worked from a novel, My Abandonment by Peter Rock, itself inspired by a news article. In 2004, a Vietnam War veteran and his 12-year-old daughter were discovered living in Portland’s Forest Park. Once rehoused on a horse farm, they fled the area and were never heard from again. Further preparation for the film involved immersive training for the cast and crew with Nicole Apelian, “a very masterful forest survivor” according to Granik. On the visual side, a range of films were examined, including Jane Campion’s The Piano and Guillermo del Toro’s Pan’s Labyrinth, for how to shoot dense vegetation. So much so, Granik powerfully juxtaposes the calm tranquillity of Portland’s parks with the boisterous, polluted atmosphere of a nearby motorway. Will sells his PTSD drugs for cash, which in turn are used for supermarket goods. But each visit to the city exacerbates his mental health, and it’s only amongst the greenery that he can relax. Granik laughs. Leave No Trace is non-judgemental about its protagonists’ lifestyles, but she doesn’t hide her allegiances on the smartphone dilemma. “They remind me of Julia and Winston (from 1984), running from this thing. I still think Orwell was unbelievable. What a prescient mind! He was a future-teller, a future-seer, a Cassandra. I don’t want to live with total tech paranoia, but we’re busting onto something.